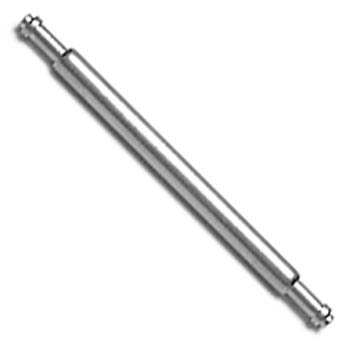 Also called digital watch spring bars. Tips will not protrude out of a foldover clasp. 12 sizes. All stainless steel. Price per one hundred of a number. Select Length: 900.084.01.100, 5/8" Center Catch 100 pcs. 900.084.02.100, 5/8" Seiko Center Catch 100 pcs. 900.084.03.100, 7/16" Center Catch 100 pcs. 900.084.04.100, 5/16" Center Catch 100 pcs. 900.084.05.100, 1/2" Center Catch 100 pcs. 900.084.06.100, 11/16" Center Catch 100 pcs. 900.084.07.100, 1/2" Extra-sturdy Case Bars 100 pcs. 900.084.08.100, 5/8" Extra-sturdy Case Bars 100 pcs. 900.084.09.100, 3/8" Center Catch 100 pcs. 900.084.10.100, 15/32" (12mm) Center Catch 100 pcs. 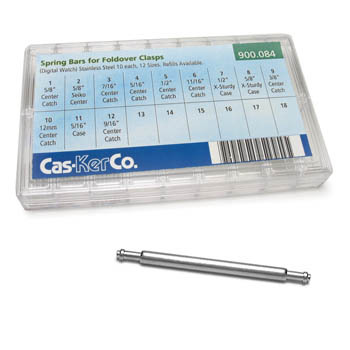 900.084.11.100, 5/16" Case Spring Bars 100 pcs. 900.084.12.100, 9/16" Center Catch 100 pcs. Also available in packs of 12. See 900.084.01. 900.084.01.100, 5/8" Center Catch 100 pcs. 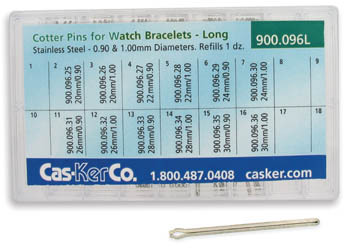 900.084.02.100, 5/8" Seiko Center Catch 100 pcs. 900.084.03.100, 7/16" Center Catch 100 pcs. 900.084.04.100, 5/16" Center Catch 100 pcs. 900.084.05.100, 1/2" Center Catch 100 pcs. 900.084.06.100, 11/16" Center Catch 100 pcs. 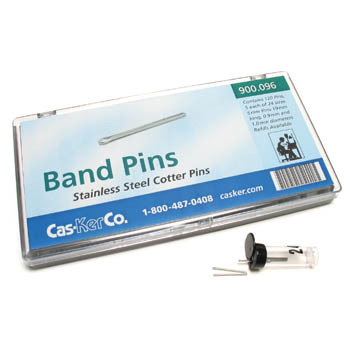 900.084.07.100, 1/2" Extra-sturdy Case Bars 100 pcs. 900.084.08.100, 5/8" Extra-sturdy Case Bars 100 pcs. 900.084.09.100, 3/8" Center Catch 100 pcs. 900.084.10.100, 15/32" (12mm) Center Catch 100 pcs. 900.084.11.100, 5/16" Case Spring Bars 100 pcs. 900.084.12.100, 9/16" Center Catch 100 pcs.